I know this could very well bore many of you but, I just have to post this because it’s been driving me up a wall for weeks now. Yes there are worse things to be bothered about and I generally am. But this bothers me as well. Lawyers, courts, judges and the a witness is put on trial. It pisses me off very much and I know things are no different in my own country. I think you know it too. The rat face on the right here is Charles Saatchi. He’s a millionaire art collector and a man of much power in the art world. He it was who brought that brilliant con man to fame and fortune by the name of Damian Hirst. He was also the man who brought to the world that brilliant light of art, that shining tower of talented light, Tracey Emin. Yeah ... she of the unmade bed and used condoms and crap laying about. That’s art today and she is rich,rich and is moving to America. I don’t blame her or Hirst. Not at all. Hey, if some idiot comes along and thinks my hand drawn line on a piece of paper is worth a million, well, can’t blame the boy and girl. 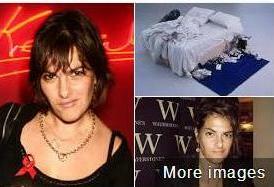 Now then Saatchi was married to Nigella Lawson, England’s domestic goddess. Some weeks ago he grabbed her by the throat in public, the photos were everywhere cos ppl like them are followed everywhere. The guy is a bully and because of his influence and money he gets what he wants and makes his own laws etc. He is very much used to getting his way. So they split. Well actually she moved out of the house, is a millionaire in her own right and wants nothing from him. Just her freedom. So the newspapers really went after him, a wife abuser and a misogynist and a bully, they called him everything that could be legally published. He then turned on her in the press and was angry because ..... she said nothing to defend him. She said nothing btw, no angry outbursts or name calling, just remained silent. The less she said the angrier he became. So just as the dust started to settle, a large fraud was discovered, in American terms is seems that a pair of sisters who worked for the couple, had embezzled at least a million dollars. 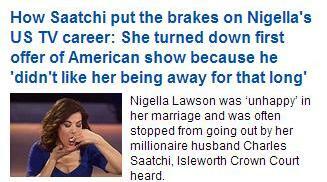 And here’s where things got really bad for Nigella Lawson. The (Italian) sisters are on trial. Right? Well you would not think so by the grilling given Lawson. It was revealed in court that she had snorted coke and smoked the evil weed. She had even allowed regular cigarettes to be used , it is claimed, by her kids. So every damn day she, who is not on trial for any of that and is merely a witness, she didn’t bring the charges to start with against the fraudsters, but is treated as if it she who is on trial. Her life and reputation is being trashed daily in court as the sisters keep coming up with these stories. Some of which are true. Lawson claimed that when her previous husband was dying of cancer, they both snorted and smoked. But she was not one of those junkies we often read about. Since she isn’t being charged with anything, it just bother me that courts can be used this way and a person can be dragged through mud this way. You know, it could be any one of us also. I mean, you’re called as a witness and yes I do understand a lawyer must be certain the witness is reliable. But hell’s bells, there’s all this missing money and a trail left behind and the sisters admitting yes, they used the credit cards given them, but only they say for the job of taking care of things and buying item requested or .... were outright gifts. To really get the full picture, you would have to do a tiny bit of research and you’ll see what’s happening. Last week the Brit PM when asked about this affair said he was part of team Nigella or words to that effect, as many people are on her side. Well folks, the judge came down on the PM like stink on poo. He took an entire court session to talk to the jury trying the sisters and telling them that they must ignore comments like that made by the Prime Minister who should never have said such a thing while a trial was ongoing. But he allows Nigella Lawson to be abused by a lawyer who has proved nothing so far in the way of innocence of the clients. I can’t understand how the demand that a kitchen be spotless , has anything to do with missing money. Can you? Hey, I’m not a lawyer. 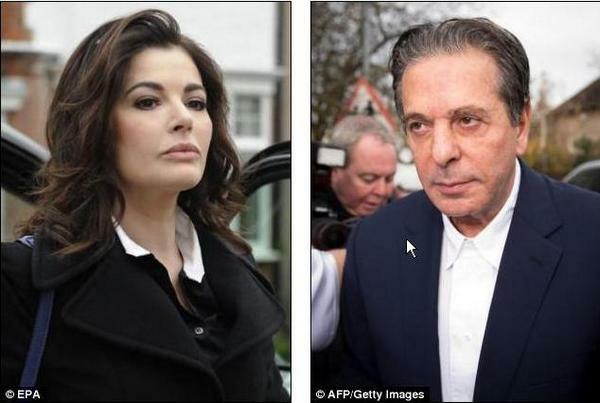 A former personal assistant of Nigella Lawson accused of defrauding the chef and her husband Charles Saatchi told today how the couple’s kitchen had to be ‘quite spotless’ by the time he had his breakfast. Francesca Grillo, 35, said her typical day would start at 6am, when she would be required to tidy the kitchen, which could take two or three hours. Grillo - who, along with older sister Elisabetta, 41, denies fraud - said it ‘would depend what happened the night before’, adding that this was due to ‘untidy children… and grown-ups’. On some occasions she made his breakfast but sometimes he made it himself, the jury was told. ‘Nigella would come down later, depending on if she had slept well,’ she added. Francesca, of Bayswater, west London, said she would then clean the bedrooms and do the laundry and shopping, adding that there were ‘always lots of shopping trips’. She would pick the children up from school and make them tea, as well as helping them with anything they needed.